Workman Publishing Company, 9780761143659, 416pp. 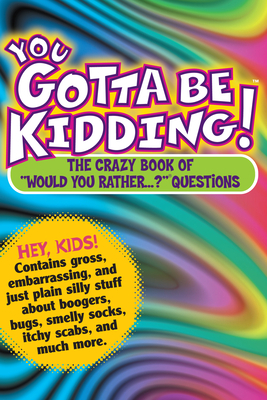 Gross, embarrassing, and just plain silly questions about boogers, bugs, smelly socks, itchy scabs, and more! Ponder the icky: Would you rather eat 10 pounds of cheese -OR- a bucket of peanut butter—with nothing to drink? The exponentially icky: Would you rather drink liquid found leaking from a garbage can -OR- chew on a hairy clump found between the cushions of an old couch? The fantastic: Would you rather be able to talk with all animals -OR- be able to understand all languages? The priority-testing: As a soccer player, would you rather mess up and score a goal for the other team but still have your team win -OR- play your best game ever even though your team loses? And the hair-raising: Would you rather swim across a river that is filled with crocodiles -OR- spend the night on an island where man-eating tigers live? Fascinating sidebars throughout are filled with interesting ancillary information—the nature of drool, left-handedness vs. right-handedness, what’s dangerously filthy and what’s just gross, why we blush when we’re embarrassed—so kids can learn something as they laugh!